Have you ever liked your friend’s WhatsApp Video status and tried to download it? Well, I’m sure you are disappointed finally after knowing the fact that there is no option to Download WhatsApp Status Videos / Images. But still you can save or download WhatsApp Video status or Image Status by following some simple tricks. So here we will let you know How to Save/Download WhatsApp Status Images/Videos in an easy way. WhatsApp is simple, reliable, very fast, free and secure messaging platform. WhatsApp messenger recently acquired by Social Media giant Facebook. After this acquisition we have seen many features rolling out from the largest messaging App. WhatsApp has added Group Video Calling, Status Image or Videos etc to their features portfolio. Out of all the newly rolled out features, one that being used extensively is WhatsApp status which includes both WhatsApp Video status and Image status. You can keep your favourite quotes, photographs or the short videos that you like the most or funny GIF images etc as your WhatsApp status. But they will appear only for 24 hours. To receive status updates from your friends, you and your friend should have saved each others contact numbers on Contacts list. You can choose whom all can see your WhatsApp status. You can either choose all the contacts or can only selected people can see your status. By default all your WhatsApp contact numbers will receive your status update notifications. WhatsApp has not provided option to download Status Images or Videos due to privacy issues. 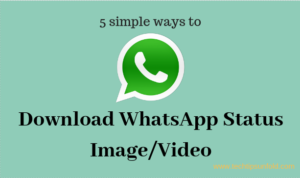 So here we are presenting 5 simple ways you can Download WhatsApp status images or Videos. I’m sure most of the people never used WhatsApp Web feature till now. But it is very flexible for users who would like to WhatsApp chat in their laptop. WhatsApp web is very flexible to use. Follow below steps to Save WhatsApp status using WhatsApp web. Open Web WhatsApp in your desktop browser. Go to Three vertical dots on top right corner of your WhatsApp android app and click on Web WhatsApp option. Scan the QR code you got in your Laptop browser. It will open your WhatsApp chat in your Desktop. Once you open WhatsApp web, on the top left bar you could see a circle for status as shown in the image below. Just click on it to see your friends WhatsApp statuses. Now click on the each contact to view their status image or video. To save status images, you just click on the image, hold it using left click and drag it to new tab in your browser. Now you can directly save that image using ‘save image as‘ option you get when you right click on that image. To download WhatsApp Video Status, after you click on contact you view their status video, right click on that video and you will find ‘Open Video in New Tab‘ option. Just click on that and navigate to that tab. Now you can easily download the status video using the download button at the bottom of the video as shown in the screenshot below. This is how you can save or download WhatsApp status image or video in simple steps. Do you know where every message, media file or statuses are stored in your phone? You can navigate to that path directly and view all the status images or videos. Open File Manager or File Explorer App in your mobile. You can find all the messages, Audio/ Video files, Images, Documents or GIF files you shared on WhatsApp. By default, statuses folder will be hidden. Go to setting option, and select ‘Show hidden files‘ option to view statuses folder. Now you should be able to see .statuses folder in that path. Open that to find all the status images or videos of your friends. This is the simplest method to download WhatsApp status of your contacts. But there is a drawback with this method. You can only save status images with this method. You can’t download video statuses. Open WhatsApp status on your WhatsApp messenger android app. Click on each contact’s WhatsApp status and take a screenshot of that. There are shortcuts set for every phone to take screenshot. Use that shortcut to easily take screenshot. Now all the status images you have taken screenshots can be viewed in image gallery. WhatsApp has over 1.5 billion users globally. WhatsApp users are spending 340 million minutes each day on Video calling. It is equivalent to 646 years of Video calls per day. 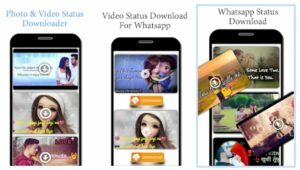 Status Downloader for WhatsApp is a simple but elegant app to download WhatsApp status images or videos. It has easy functionality to download or maintain status images. Follow below steps to use this app. Open Google Playstore in your mobile and search for ‘Status Downloader for WhatsApp‘. Click on the first app that you get and proceed with installation. Once installed, open the app and you can find options to Download all the status images/ videos and view them in gallery. This app has very good ratings in playstore and 50,00,000+ downloads. Another android app for status download is ‘Video Download for WhatsApp‘. With 10 million + downloads and 4.2 overall rating in playstore, it tops the list in Top Free Photography section. Follow below steps to use this app. Install the first one and open the app. Same as above app, here also there are two sections. One to download all the available status images or videos. Another to view downloaded statuses. WhatsApp, being a top most messaging platform has very much concerns regarding Users privacy. Every message you send to your friends through WhatsApp being end-to-end encrypted. No one can read or hack your messages. These are all the options available to Download or Save WhatsApp Status Images or Videos. Recommended to use first three mentioned methods itself in order to avoid using third party android apps. If you have any queries or issues regarding any of these mentioned methods, feel free to let us know through comments. We will be glad to help you. Cheers! !